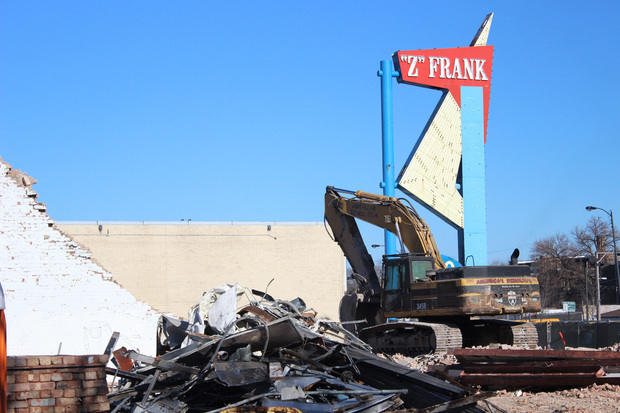 The former Z Frank Chevrolet being demolished. WEST RIDGE — The spot where "Z" Frank Chevrolet sat since 1936 might see a new car dealership take its place in the coming months as an Edgewater Toyota store makes progress in their move. The Chevrolet lot at 6016-60 N. Western Ave. was demolished in 2014, including its iconic, 50-foot-tall neon "Z" Frank sign after the business moved out in 2008. Eventually, the family-owned business found a new owner for the property in Bob Loquercio, who owns the 120-employee Chicago Northside Toyota at Broadway and Hollywood in Edgewater. According to Mayor Rahm Emanuel's office, 65 new jobs would be added to the location's workforce. The new Toyota/Scion dealership would include a 49,000-square-foot building with a showroom, service department and a 22,000-square-foot parking lot built for 222 vehicles, according to the mayor's office. A recently introduced tax incentive by Emanuel would help facilitate the construction of the new $25.7 million project at 6040-50 N. Western Ave., the mayor's office said. The incentive reduces the property tax assessment level on eligible commercial properties, saving the owner about $1.5 million in property taxes over five years, according to the mayor's office. Overall, the project will generate an estimated $71.8 million in sales tax revenue over that same five-year period. Loquercio said he is moving because of the CTA's plans to demolish a portion of his current dealership for extensive Red Line construction planned for 2017. Loquercio told DNAinfo Chicago in December that Toyota Motor Corp. prohibited him from incorporating the "Z" Frank sign into the building's design. "It broke my heart when they told me I couldn't keep that sign," Loquercio said. "I would have loved to." Still, he said inside his new store he plans to commemorate the Franks' history with a plaque and photo of the sign. He said he also wanted to be a part of what he called a resurgence of an "automotive row" on Western Avenue.